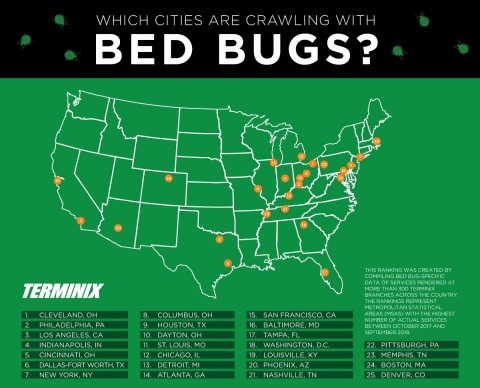 by Brianna Crandall — November 23, 2018 — Ahead of one of the busiest travel days of the year, Terminix, a national and international provider of termite and pest control services and a ServiceMaster company, just released its 2018 ranking of the Top 25 most bed bug-infested cities in the country. Cleveland “crawled” its way to the top of the list for a second consecutive year, followed by Philadelphia and Los Angeles. Ohio had the most cities on the list, taking four of the top ten spots. Texas, Tennessee and Pennsylvania each had two cities make the notorious list. *This ranking was created by compiling bed bug-specific data of services rendered at more than 300 Terminix branches across the country. The rankings represent Metropolitan Statistical Areas (MSAs) with the highest number of actual services between October 1, 2017 and September 30, 2018. Although bed bugs were once considered a limited problem, they made a comeback in the 1990’s and continue to be a concern, with businesses representing a majority of Terminix’s customers. The company notes that in areas with active bed bug populations, the reported incidences can quickly increase several hundred percent over the previous year or years. To prevent a bed bug outbreak, businesses should educate all staff members on how to look for signs of infestation and what to do if bed bug activity is found. While some industries are more susceptible to infestation than others, the more customer and employee traffic a business has, the more the business is at risk, the company notes, since bed bugs can hitch a ride on any item and be carried into any home or building. Discovery of suspected infestations or bed bug activity often comes via complaints from customers or staff, so Terminix says it is important to train employees to address customer concerns related to bed bugs sympathetically, professionally and according to company policy. Regular inspections of key customer and employee contact areas and possible harborage sites is essential, says the company. Terminix offers resources for companies serious about bed bug control or wondering if they might have an infestation. But the company advises that if bedbugs are suspected, facilities managers (FMs) should contact a pest control company immediately to schedule an inspection, and not attempt to handle the infestation on their own. According to Terminix, the Journal of Economic Entomology reported that over-the-counter foggers have been proven ineffective and are not recommended for use, but Terminix experts use solutions such as RapidFreeze, which transforms liquid carbon dioxide into a dry ice “snow” that effectively freezes and kills bedbugs in fewer than 60 seconds. To find out more about Terminix’s integrated pest management services for commercial bed bug control, visit the Terminix website. Want to make mopping floors safer and more effective? Check out Rubbermaid Commercial Products’ new lineup December 7, 2018 In "Products and Services » Cleaning Equipment & Supplies"